On Thursday night my friend Chinwe and I went to the inaugural concert in the BSOPulse series. BSOPulse is a grant-funded collaboration between the Baltimore Symphony Orchestra and WTMD, which is Baltimore’s NPR Music station out of Towson University. It brings in indie bands (this year’s are Dawes, Wye Oak, Dr. Dog, and The Lone Bellow) to play with the Baltimore Symphony Orchestra. I was stalking this series for probably about 4 months before they ever officially announced it. I pretty much only listen to Baltimore radio stations when I’m in the car and then I just flip through looking for songs I like. I rarely hear much of what the DJs are saying, but one morning on my way to work I caught the tail end of one of the WTMD DJs saying something about Dawes and the BSO. It wasn’t really enough to go on at that point and I couldn’t find anything about it immediately, but I kept looking. Eventually many months later they finally made the official announcement about this series, and it was even more exciting than I thought it was going to be. This year marks the BSO’s 100th season, and they’re doing a lot of interesting and fun stuff in addition to their more traditional fare. They seem to be making a big push this year to attract a younger audience including this concert series. I think this concert did exactly what it was supposed to do. It brought a crowd to the BSO that would normally have never come and introduced them to an accessible piece of symphony music to hopefully encourage them to return for something else. 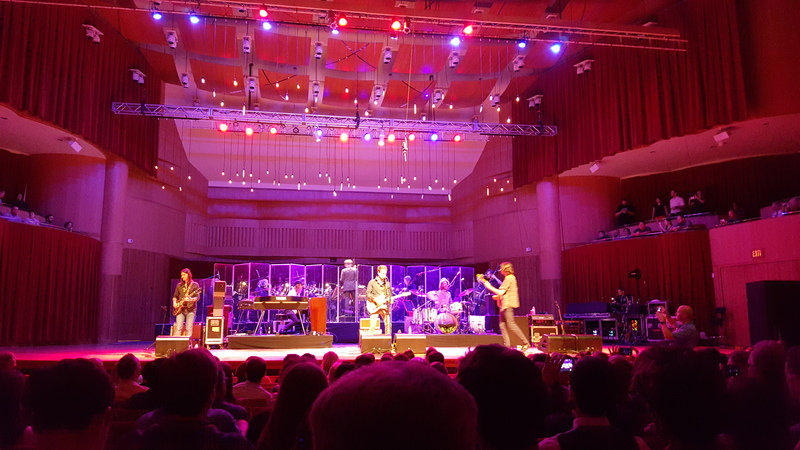 When asked if it was their first time at the Meyerhoff, the majority of the crowd indicated that it was. Nicholas Hersh, the BSO’s assistant conductor, who conducted the symphony at the performance did a good job of introducing people to the symphony in a way that let people who may have no experience with a symphony performance know what to expect in way that didn’t seem like he was talking down to the audience. The performance started out with the BSO string section playing Phillip Glass’s Symphony No. 3, which is a 25 minute piece. It was really a nice introduction to the symphony for anyone who may not have been before. During the set change Alex Cortwright, WTMD’s morning DJ led a discussion between Taylor Goldsmith of Dawes and Nicholas Hersh about the Phillip Glass piece and how it relates to the music that Dawes plays. I really like that they added that piece into the show. After that Dawes came out and played a set by themselves. You could tell that they were really stoked to be there. Aside from the fact that Taylor Goldsmith kept saying so, they just looked filled with joy and wonderment in a way that I haven’t seen in the other times I’ve seen them live. 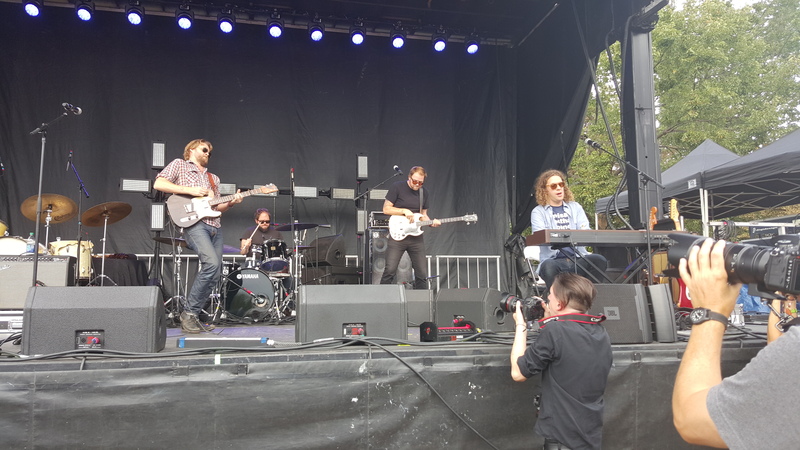 They played a good mix of stuff from their new record along with old favorites, although I was a little bummed that they didn’t play “Right on Time”, which is definitely my favorite song off the new album and may have possibly overtaken “If I Wanted Someone” as my favorite Dawes’ song. They of course played “When My Time Comes”, which got the crowd on its feet for the first time during evening. Speaking of joy at the point in the last chorus where they always drop out and let the crowd sing on their own, Taylor Goldsmith had this look of pure, unadulterated joy his face like I’ve never seen. 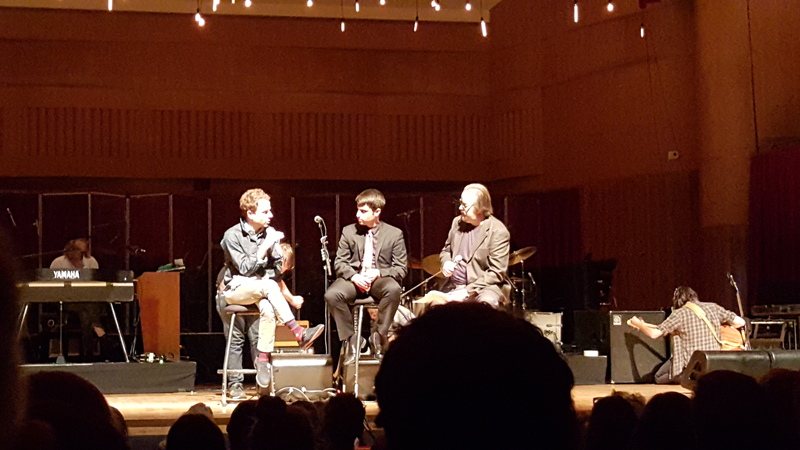 The performance ended with an actual collaboration between Dawes and the BSO. Nicholas Hersh created arrangements to go along with three of Dawes’ songs. They played “Things Happen”, “Just Beneath the Surface”, and “A Little Bit of Everything” together and it was glorious. I wish they had done more than three songs, but I understand it’s not realistic for them to write a bunch of arrangements and learn them for something they’re only probably ever going to play this one time. It was a really great performance and something I hope continues even after the grant funding presumably ends after this year. I already have tickets for The Lone Bellow show later in the season. I’m contemplating going to the Wye Oak one too. I’m not much of a Dr. Dog fan, so I’ll probably sit that one out even though I’m sure it will be wonderful too. I definitely encourage everyone to check out at least one of the remaining performances. Last night I saw Of Monsters and Men in concert for the third time. Interestingly I realized that I’ve seen them for free two of the three times. 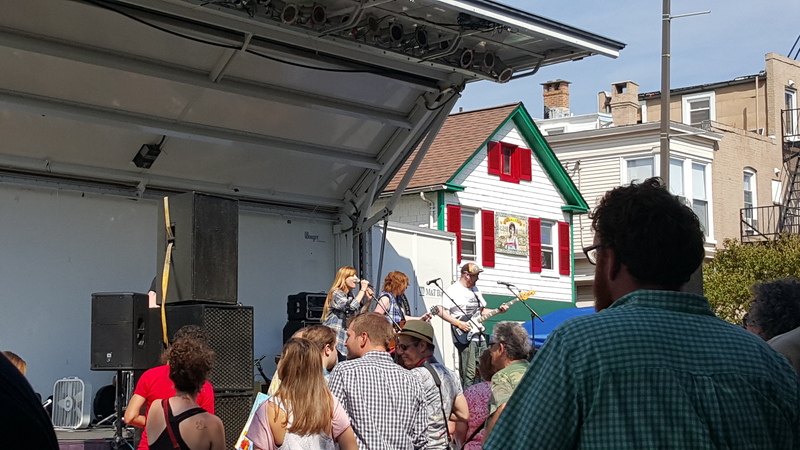 The first time they were playing a free concert as part of an Icelandic festival in Silver Spring, Maryland. I did actually pay to see them a few years ago last time they were at Merriweather. Last night they were back at Merriweather, but I didn’t have to pay because I won two free lawn tickets from http://www.thisisourjamdc.com/. I was very excited to win tickets because it assured I was going to go, which I had wanted to do since I saw they were coming back. However my concert schedule for the summer was pretty full. I don’t have that many friends who enjoy the same music I do or are interested to going to that many concerts. Between seeing some shows on my own, dragging my husband, and actually convincing friends to go with me I do get to see a fair amount of the shows I want to see. Although I will go to some venues on my own Merriweather isn’t one where I really want to do that. I don’t mind going to a standing room only show by myself, but sitting outside on the lawn at Merriweather by myself seems very lonely. I have to really want to see a show and have no one else to go with before I’ll force my husband to go, and this show didn’t quite meet that threshold. I do have friends that like Of Monsters and Men, but I’d already seen multiple concerts with them over the summer and they don’t all have as much disposable income to throw at concerts as I do, so I didn’t bother trying to find out if they wanted to go figuring if they did they would let me know. Happily once I won the tickets then I could just offer my friend Lindsey a free ticket, and then she was happy to go with me. Our free lawn tickets even got a free upgrade to pavilion seats, so it was even better. I guess a lot of people have forgotten about Of Monsters and Men in the two years since they were last at Merriweather. People’s musical memories are short and sadly their second album hasn’t gotten the kind of traction their first album did for whatever reason. I really like it, but even the non-commercial radio stations I listen to didn’t seem to play the first single off of it for very long. At any rate the crowd was pretty sparse, so they invited people with lawn tickets to come in and sit in the pavilion seats. The opening act was a Danish band called Oh Land. I had never heard of them before, so I was going into their music completely cold for this show. I didn’t hate any of it, but I only actively liked about half of it. Their upbeat songs were fantastic and I would totally listen to those again, but I didn’t care for their slower songs nearly as much. 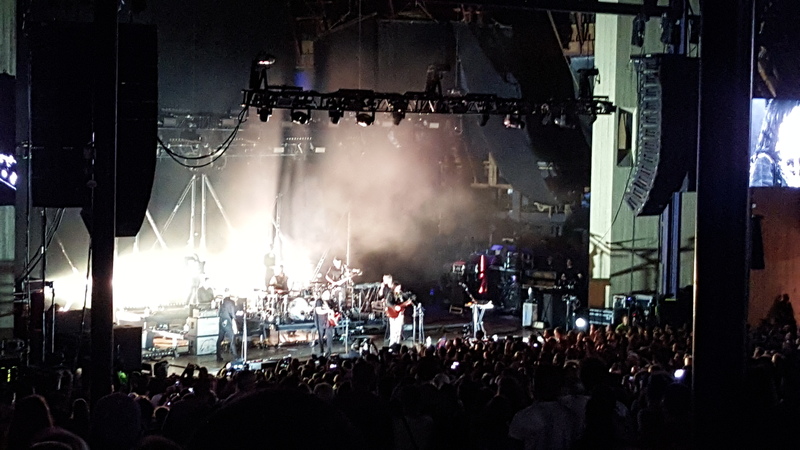 In my review of their last concert at Merriweather I said I didn’t really feel like I would need to see Of Monsters and Men again in concert until they had new music to play. 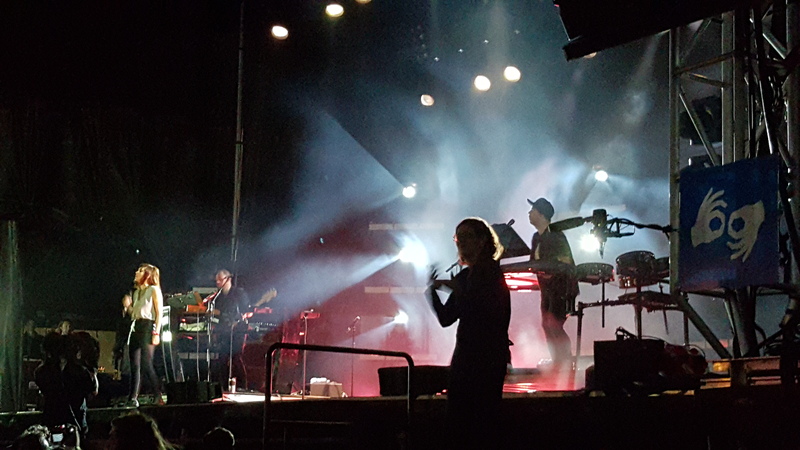 Their music is fantastic and it’s really fun to hear and see played live, but by now you should know that I want more from a live show than just a band getting up on stage and playing their songs. Of Monsters and Men pretty much just does that, so I’m not rabid about seeing them as much as possible like I am with some acts. Nevertheless, I was in fact happy to hear them play their new music live. As I said they are just a really fun band to watch play. There’s a whole lot of them on stage. I honestly don’t know anyone’s name or all the instruments that the play nor have I kept track of band members to know if anything has changed. There were 9 people up there last night. I feel like there might have been a few more last time I saw them, but I could be very wrong on that. One of the women who tends to be in the back or off to the side on stage at least the three times I’ve seen them pretty much plays all the instruments. It’s enjoyable to see everything she pulls out. The music itself is just fun to dance to as well, so it’s a lot of fun to be in a crowd with a bunch of people grooving to it. They played a nice mix of stuff from their newer and older albums. I am also always very intrigued by bands who choose to go against the grain and not save their biggest hits for their encore. I was especially interested in the fact that they ended the concert with a song from their new album and not even the single from it just a random song. I like it. I like a band that doesn’t necessarily do what you expect of them. It was a great show and I’m really glad I got to go. My neighborhood has two street festivals every year: HonFest in June and Hampdenfest in September. Although HonFest is much bigger and more well known, Hampdenfest is by far my favorite of the two. I like the fact that it is more low key and really about the neighhborhood businesses and organizations. I missed Hampdenfest last year because I was out of town for a wedding. I was very sad about it, especially as Future Islands played. I was happy to be back this year though. As with any good street festival there were lots of food options. I went out and wandered around checking out all the booths for awhile. I didn’t buy anything, but did get some lunch and some kettle corn to eat while I watched The Ginger Blossoms perform. They are an all red-headed Gin Blossoms cover band fronted by women. The fact that the vocalists are female gives the songs a little bit of a twist, but other than that they’re just a straight out cover band. I very much enjoyed listening to them. I wasn’t a huge fan of mid to late 90s and early 00s rock. Those were my high school and college years and I’m given to understand that means I should have fond memories of the music of that time and be nostalgic about it. I really do not though. Despite my general apathy towards that music, I really did like the Gin Blossoms at the time and owned some of their CDs. I had kind of forgotten how many songs of theirs I liked until I heard them all played yesterday. It was a fun stroll down memory lane. I ended out the day watching the toilet bowl races. Think soap box derby except that all the vehicles look different and somehow have to incorporate a toilet into them. It’s always an enjoyable event and people can come up with some pretty impressive vehicles. I was kind of annoyed that they didn’t do all the safety practice runs until the advertised even start time. Next year they should really do that beforehand. We spent an hour waiting around for the actual races to start and thus wound up leaving before the end because we didn’t want to keep hanging around out in the hot sun that long. As usual it was a fun day. I look forward to next year’s. 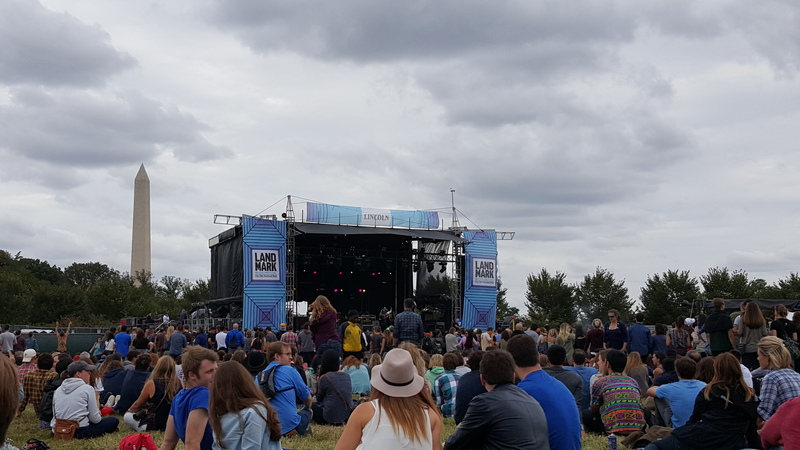 After writing my last post on Major Lazer and DJ Snake’s “Lean On” I realized that often when I write about pop music on this blog I tend to throw in a caveat about liking it until I get sick of it. It made me think about how I consume what is typically considered pop music. I obviously am a music lover. I am still the weirdo in this day and age who buys lots of albums. The thing about pop music though is I really only consume it by listening to it on the radio or through inevitably hearing it being played over speakers while out and about in the world. I rarely if ever buy pop music. If I do it’s pretty much only ever the single and not the album. Most likely though I don’t buy it at all. On the rare occasion I choose to listen to those songs outside of my car radio is through Spotify or YouTube. I guess that’s the way most people these days are listening to pop music, so I’m at least right on point with that. It’s obviously not that I don’t like pop music. I’ve written lovingly about a number of pop music songs on this blog. Mostly to me pop music fits a very specific function in my music filled life, and the function is to be disposable enjoyment while I’m driving. I mean that in the best way possible. Pop music signifies a specific time. It even moreso than the music I collect and listen to over and over again is what I associate with specific events or time periods in my life. It’s the stuff that penetrates throughout a specific time but then mostly fades away. Sometimes it endures on the soft rock or oldies stations, but much of it burns bright and then gets over played until people can’t stand to hear it ever again. It sounds a little ridiculous to say, but I like pop music for what I like it for. I’m never going to be the one buying pop music albums or fighting to see those artists in large arena shows. The artists I connect with on that level are not generally the people whose songs wind up on pop radio. However, I’m also not the obnoxious hipster that looks down my nose at pop music as if it’s beneath me. I appreciate it for what it is in my life and don’t begrudge anyone enjoying music in ways different from me. I’m just glad I live in a time when it’s easy for me to access not just the pop music on the radio, but all kinds of other music as well. In past years I’ve written about my guesses for what the song of the summer will be or talked about whatever I think it was or my personal pick even if I knew the real song was something I hated like “Fancy” or “Blurred Lines”. I didn’t do that this year for whatever reason, but now that summer is over I can talk about how things seem to settle out. In other summers there seemed to be a clear cut winner, but then sometimes like this summer it seems like people can’t agree. Apparently radio play and things like Spotify can also tell very different stories. I remember last year knowing that Iggy Azalea’s “Fancy” was the song of the summer even though I never liked it. Then at the end of the summer Spotify came out with their summer listening statistics and said it was in fact Calvin Harris’s “Summer”. That was a song I much preferred so I decided I’d rather go with their song of the summer even though I heard it only a fraction of the times I heard “Fancy”. So what does all this have to do with “Lean On” you may ask. I mean aren’t I supposed to be writing a blog post about a song that I love here not going on about the song of the summer. Well here’s where it all comes together. I literally heard this song once one the radio this summer and never just when I was out and about in the world. Based on all of that the song I couldn’t escape, and the song I thus considered the song of the summer was Walk the Moon’s “Shut Up and Dance”. Bizarrely to me that didn’t seem to be on anyone else’s lists. Every discussion I heard or read about the song of the summer never included that as a contender. It kind of boggled my mind. Finally at the end of the summer two of the podcasts I listen to threw that song into contention, but this summer I never really did feel like there was an official consensus on what the song of the summer was. Spotify however again put out their statistics on the song of the summer and told us that this year it was “Lean On” by Major Lazer and DJ Snake. I was telling my husband about how I was intrigued by this and said that Baltimore radio stations must not be with it because they never played this song. Cut to the next week when all of the Baltimore pop radio stations broke this song out in full force. Way to be with the times Baltimore pop radio. At any rate it’s a song I really like a lot and do think would have been a great song of the summer. Alas, I’ll have to make it the song of my fall I guess. That is until Baltimore pop radio plays it to death and I can’t stand to hear it one more time. For now though I’ll be seat dancing to it in my car. I’m guessing most of the people reading this will not have watched the USA show Playing House, which is a real shame because it’s a delightful little show. It just wrapped up it’s second season this week. USA just barely decided to renew it for a second season and I fear that we won’t get a third. That would be a travesty because I love it. It’s the perfect little blend of great characters, humor, and relationship driven plots that is far too lacking on television these days. All of the shows like this seem to be disappearing, and I hate it. The show stars Lennon Parham and Jessica St. Clair as Maggie and Emma who have been best friends since they were kids. When Maggie finds out her husband has been cheating on her while she is pregnant, she divorces him and Emma moves back to the small town they grew up in to help her with the baby. They are a little quirky and over the top, but at the heart still completely realistic, human characters. Their friendship feels genuine and like something we all probably wish we had. The show sold me in it’s first episode with this scene of them singing Kenny Loggins’ “Celebrate Me Home”. Last night the show ended with a fantastic episode featuring Kenny Loggins himself. I love me some Kenny Loggins. This show certainly knows its way to my heart. If you haven’t seen the show you should definitely watch the two short seasons we’ve gotten and then join me in begging USA to renew it for a third season.